If you want to supplement with carbon dioxide in your tank, a CO2 diffuser is a must-have piece of equipment. If you’ve never added carbon dioxide to your tank before, you may be wondering what a diffuser is? What is one used for? Would one benefit your aquarium? How do you place and install one in a tank? These are just a few of the questions we’ve been asked on the subject. In this article, we’re going to tell you everything you need to know about CO2 diffusers and how they work. You’ll also learn what equipment is used alongside one and why. You’ll discover what you should be thinking about before you buy a diffuser of your own and finally, we take a look at a handful of the best CO2 diffusers available today. What is a CO2 Diffuser? What Does it Do? What Type of Aquarium Benefits from One? What Other Equipment are They Used With? What Should I Consider When Buying a CO2 Diffuser? A CO2 diffuser is responsible for distributing carbon dioxide in your aquarium. As the name suggests, it expels carbon dioxide gradually and uniformly, rather than in concentrated bursts. You’ll be able to see this process in action through the bubbles that are emitted. As you can imagine, this is an important job. If too much carbon dioxide enters your aquarium at once, it can have disastrous consequences. Your fish can end up suffocating from a lack of oxygen. 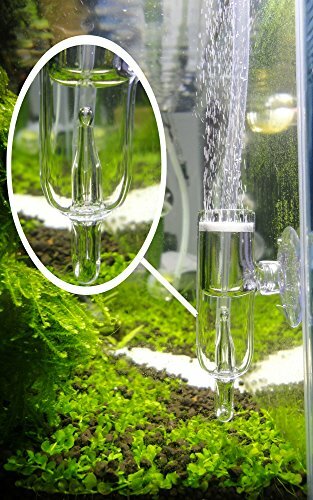 A good CO2 diffuser outputs small bubbles, rather than large ones. Huge bubbles of carbon dioxide will not diffuse as well as small or fine ones. Gas in water is diffused through surface area contact, how much water is in contact with the gas. A fine stream of bubbles has a far greater amount of gas in contact with the water than large bubbles do, and is therefore more likely to be absorbed into the water. Diffusers can be made from materials ranging from different types of plastics to ceramics, glass, or stainless steel. They can vary in size and shape, depending on the model. Some resemble tubes, while others have a distinct shape. The method of diffusion is also specific to the model of diffuser you choose. Most types use spiraling tubes to allow the carbon dioxide to enter the aquarium with control. Other techniques they use include using porous stones or reactors. For the former, carbon dioxide passes through the porous stone and breaks into tiny bubbles. For the latter, reactors agitate aquarium water and carbon dioxide in a container, usually a cylinder. The carbon dioxide-infused water is then pushed throughout your tank. You can also find bell-shaped models. These types hold carbon dioxide in a vessel that resembles a bell, allowing the gas to diffuse gradually. The majority of CO2 diffusers are built to withstand being submerged underwater. That said, there are also types designed to work outside of your tank. With these, only the diffuser tube will get wet. 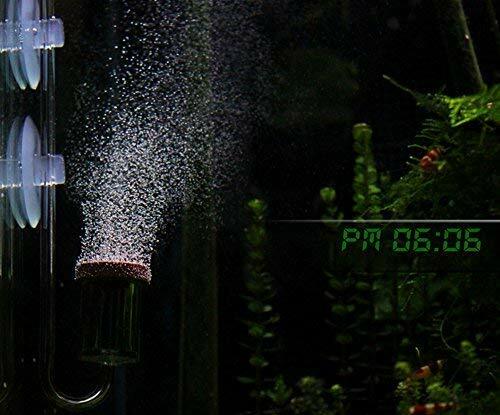 Planted aquariums will reap the most benefits from a CO2 diffuser. The plants in your tank use the extra carbon dioxide, with increased levels in your tank boosting plant growth by speeding up photosynthesis. Nevertheless, adding carbon dioxide is helpful for almost any aquarium. Remember that your tank is a contained ecosystem. Everything exists in a balance. You can’t change anything in your aquarium without directly or indirectly affecting something else. This means that thriving plants will promote healthier fish—adding more oxygen to your tank. Plants also gather nutrients from your aquarium substrate, including organic waste. This waste – uneaten fish food and feces – can be harmful if it builds up unchecked. Higher levels of carbon dioxide encourage plants to grow faster than usual. All this growth will encourage your plants to consume more nutrients, clearing up your substrate. Plants also play a role in controlling algae growth. Contrary to popular belief, algae are a species of plant, not a fungus. They need carbon dioxide, light, and nutrients to survive. The difference is that algae are far hardier, these nuisances can flourish almost anywhere. 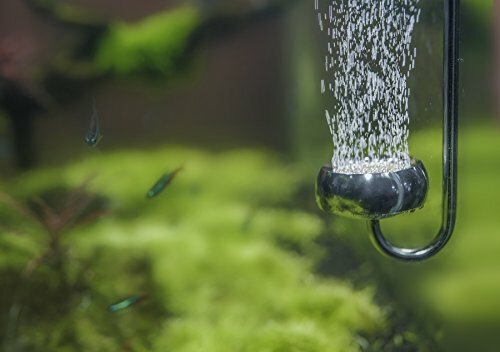 Both saltwater and freshwater aquariums can fall victim to a bad case of algae under the wrong circumstances. If your plants aren’t in the best of shape, algae can grow out of control because they have little competition for the resources to grow. Weak or dying plants can be terrible for your fish too. If left to rot, your plants will give off chemicals such as ammonia and nitrogen. CO2 diffusers are usually part of a comprehensive system to distribute carbon dioxide in your aquarium. Some pieces of equipment and accessories are essential, while others are just useful. A CO2 regulator is a device that gives you control over carbon dioxide levels in your aquarium. As carbon dioxide is colorless and odorless, a regulator is a necessity. Playing a guessing game with this gas can be dangerous: don’t risk the safety of your tank’s inhabitants. Regulators almost always come equipped with low and high-pressure gauges. The low-pressure gauge relates to the pressure of the carbon dioxide going into your tank. The high-pressure gauge tells you how much carbon dioxide is left in your cylinder. When this arrow starts to decline towards the red, you know you’ve nearly run out. The needle valve on your regulator is akin to the control panel. Different models of regulators can have check valves that are simplistic or advanced. For example, giving you the option to control bubbles of carbon dioxide released per second. Most regulators include a check valve. If you find a regulator on the market that doesn’t, avoid it. This valve stops water from reversing into your regulator and causing damage and is an important safety mechanism. For further details, you can check out our guide to the best CO2 regulators. A bubble counter isn’t an obligatory part of the setup, but you might want one anyway. This device will give you a visual of the carbon dioxide entering your tank. Not only is it interesting to see, but you can also monitor carbon dioxide flow. If you feel like too many or too few bubbles are being released, you may need to adjust it. The cylinders are where your carbon dioxide is stored. You can buy different sizes of cylinders, ranging from small to large. The smaller cylinders are often referred to as “paintball tanks,” and are usually about 20 ounces. Larger tanks are typically five pounds or more. Cylinders are not reusable. Once you’ve exhausted their gas supply, you’ll have to buy a new one. The value of tubes in your carbon dioxide setup is understated. You want to invest in tubes that are appropriate for carbon dioxide. Otherwise, your tube might end up leaking or tearing. Drop checkers are a quick way to get a read on carbon dioxide levels in your tank. Most of these kits come with color-coded guides that will tell you if levels are too low or too high. As you may have guessed, a drop checker is a crucial part of the setup. You need to know what’s going on in your aquarium before you start regulating carbon dioxide flow. A solenoid valve takes a lot of the effort of manual monitoring off your hands. This gadget can be set to regulate when and how carbon dioxide is circulated in your tank. For example, you can set the carbon dioxide flow to be automatically reduced at night. You won’t have to remind yourself every evening. Before you buy one, there are a couple of things to keep in mind. A diffuser is a vital piece of equipment with a very important job, you need to be selective and make sure you get the right one for your tank and it’s inhabitants. Quality is crucial. You want to pick one that is durable and reliable. Poorly built diffusers are more prone to leaking, damage, or malfunction over time. If you already have some equipment at home, consider compatibility. Not all diffusers work with all tubing. Certain models don’t work with low or high flows of carbon dioxide. Don’t forget to think of the future. Will you be able to find supplies that work with your diffuser easily? Depending on the product you buy, your diffuser may come with extras. If you don’t have any equipment at all, this can save you time and money later. Plus, it’s always pleasant to receive supplemental accessories with your purchase! There are CO2 diffusers that are aesthetically pleasing. Functional doesn’t have to mean bulky or unattractive. You don’t want your diffuser to be the central focus of your aquarium when you look in on it. Now that you know how CO2 diffusers work and how to choose one, it’s time to buy one of your own. From here, we take a look at the best CO2 diffusers available today. This diffuser is made from sturdy, high-quality glass and ceramic. There are two sizes available – one and a half inches and two inches. The smaller model works for tanks that are between 30 and 50 gallons. The larger one is compatible with 50- to 70-gallon tanks. The U-shaped tube can fit over glass up to 0.6 inches thick. An additional advantage of a U-shaped tube is eliminating the chances of carbon dioxide blockages. The diffuser itself is discrete and bowl-shaped. Carbon dioxide is diffused through the round, white ceramic membrane. The bubbles of carbon dioxide that pass through are small and numerous. This is due to the large surface volume of the ceramic plate. Diffusion will be continual, more like a mist than bubbles. 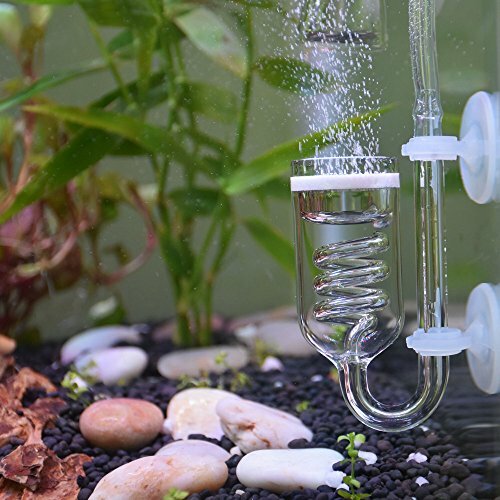 Placing the Pollen Glass CO2 diffuser in your tank is simple. It comes with two suction cups on either side. All you have to do is pick a corner of your aquarium and affix it to your tank walls. If you’re wary of suction cups falling off or weakening, you shouldn’t be. These ones will affix firmly to the diffuser itself as well as your tank. Finding appropriate tubing won’t be a challenge. You can use standard, commercially available tubing. One of the stand-out features of this model is the design. Aside from being small, the white ceramic plate glows brightly underwater. It has a sleek and elegant look about it that is a pleasant addition to any aquarium. Compatible with standard aquarium tubing. Made of glass and ceramic. Includes diffuser and U-shaped tube. Compatible with 30- to 50-gallon tanks or 50- to 70-gallon tanks. Diffuses carbon dioxide in a fine mist. Glass stem can break if mishandled. Can only be placed in corners. Only works with rimless tanks. The Pm0606 range features two separate diffusers. The models include CO2-Small and CO2-Big. As the names suggest, each works with smaller to larger sized aquariums. Both of these diffusers are nearly identical in design. The only thing that differs between them is the size. They are built with plastic and use porous ceramic to distribute carbon dioxide. Despite the ceramic disc being relatively compact, it’s more powerful than it looks. Carbon dioxide will stream out in micro-bubbles that will circulate through your tank steadily. Even though you’ll get a decent quantity of bubbles, the surface of your tank won’t be too disturbed. It also operates quietly. You won’t hear the trademark bubbling that you may with other diffusers. You and your fish will hardly notice it’s presence once it’s installed. The plastic is durable and ideal for those of you who are wary of broken glass. Accidentally jostling this diffuser the wrong way isn’t likely to break it. Best of all, you aren’t able to tell that it’s plastic rather than glass just by looking at it. The reddish-brown ceramic rests on top of a cylinder, giving it a pipe-like appearance. Both models are small and inconspicuous. The natural color of the ceramic will help this diffuser blend in with your tank rather than stand out. These CO2 diffusers are adaptable and perform well at both high and low flows. Whatever you set your regulator to, you don’t have to worry about decreased performance. Bubbles will stay small, even when you up the pressure. Setting up a Pm0606 is a breeze. It comes with a large suction cup to prevent the diffuser of your choice from moving around or slipping. Two sizes make it compatible with almost any size of aquarium. Made of acrylic plastic and ceramic. Works well at all flow levels. Must be soaked for a long time before it works. Suction cup can become milky over time. The Fibst CO2 Diffuser comes in three sizes to fit any aquarium. They are made of stainless steel and use a ceramic disc to diffuse carbon dioxide. Although the size of the ceramic disc differs depending on the model, the rest of the design is the same. If you have a high-pressure flow rate, this diffuser is ideal. You’ll get small carbon dioxide bubbles—and lots of them. This diffuser is ideal for aquarium owners who prioritize hygiene. As it is made of stainless steel, cleaning and sterilizing it is easy. You don’t have to be afraid of getting too rough with a sponge and shattering it. The ceramic stone can be taken out for convenience to be cleaned separately. You just have to turn the protective covering counterclockwise to access the ceramic sheet, and you’re done. There are no mechanisms that will wear down or get stuck with age. There are several other perks to the stainless steel design. Firstly, you can relax while you’re handling this diffuser. The only thing you have to be cautious about when setting it up is your aquarium tank. Next, stainless steel is long-lasting. It’s less susceptible to rust, dents, or other types of damage than other materials. Lastly, stainless steel can make for a stylish addition to your tank. It won’t ever get foggy, like certain plastics or glass might. Installing one of these is as uncomplicated as washing it. It has a U-bend that can be hooked over the side of your tank. At 1.1 inches wide, this is appropriate for the thickness of most aquarium tanks. Fibst diffusers come with a six-month warranty for the ceramic plate and a 2-year warranty for all other parts. If you run into any issues after purchase, the manufacturer will be there for you. Stainless steel diffuser with a U-shaped tube. Suitable for glass up to 1.1 inches thick. 24-month warranty for all stainless steel parts. Six-month warranty for the ceramic plate. Compatible with tanks 20D by 350L, 30D by 300L, and 30D by 350L. Cleaning it isn’t a chore. Compatible with almost any size tank. Too strong for low-flow setups. This delicate glass diffuser is suitable for tanks up to 20 gallons. At less than one inch in diameter, it uses a ceramic stone to distribute carbon dioxide. This will guarantee you a small stream of bubbles. If you’re a novice aquarium owner, you can ease into the world of carbon dioxide supplementing with this diffuser. It’s built to be user-friendly and can be installed quickly if you’re eager to get started. If you’re not a newbie but you’re looking for simplicity, this product still fits the bill. It’s a small cylinder with a U-shaped pipe that fits standard CO2 tubing—four to six millimeters. There are no glass tubes or other fiddly parts to it. To set it up, connect it to a tube and set it inside your tank. A suction cup mounted to the back makes for effortless installation. In case the first suction cup wears out, you’ll find an extra one included in the box. Cleaning won’t be as nerve-wracking as with larger glass diffusers. You only have one small part to wash, rather than multiple tubes and parts. This isn’t to say that you don’t have to be careful, but a single part is easier to handle than multiple bits and pieces. In spite of the basic design, the Pollen Glass diffuser comes with an extra feature. Cross off buying a bubble counter on your list, it comes with a built-in bubble counter so that you can see carbon dioxide flow in action. Dimensions: 0.8 inches in diameter, 3 inches in length, 1.6-inch long U-tube. Compatible with tanks up to 20 gallons. Fits four- to six-millimeter tubes. Fine distribution of carbon dioxide bubbles. Can require more than 24 hours of soaking before it works. Yagote offers three CO2 diffusers for aquariums of various sizes. These include the Nano, the CO2 diffuser set, and the 1.6-inch version. These diffusers are made from high-quality glass and include ceramic stone. The stone diffusers work well to circulate micro-bubbles of carbon dioxide. Regardless of size, the ceramic stones diffuse carbon dioxide uniformly across the disc. The Nano diffuser is built to work in smaller aquariums—up to 20 gallons. It is petite, pipe-shaped, and mounted with a suction cup. If you’re searching for a diffuser that will be barely noticeable, this will appeal to you. As with most basic models, installation is quick and painless. All you have to do is hook up the U-shaped tube and place it on your tank wall. If you’re looking for a more inclusive set-up, you can buy the CO2 diffuser set. This includes the Nano diffuser as well as bonus equipment. You’ll get a check valve and an extra suction cup for mounting your unit. The 1.6-inch diffuser is a larger model for 30- to 50-gallon tanks. Unlike the Nano, the design is more like that of a bowl. As the ceramic disc has a wider surface area, carbon dioxide is distributed in a fine mist. Although it’s larger, it won’t have a cumbersome presence in your tank. The white ceramic disc looks almost ethereal underwater. It comes with two suction cups to be mounted in the corner of your aquarium. Includes check valve and extra suction cup. Compatible with 30- to 50-gallon tanks. Compatible to fit any aquarium needs. CO2 diffuser set includes useful accessories. Small and plentiful carbon dioxide bubbles. Suction cups grow weak with time. Once you have your CO2 diffuser, all you have to do is place it in your tank, right? Well, this is easier said than done. No aquarium is alike, the layout of each is unique. There are also areas where a CO2 diffuser should never be placed. Let’s begin by covering the placement choices you should be avoiding. Never bury your diffuser underneath your substrate. It might seem tempting to hide it out of sight, but you’ll defeat the purpose of it. Your substrate will block the carbon dioxide bubbles from diffusing as they should. Even if you have a diffuser that dispels micro-bubbles, they won’t get past the substrate. Instead, the bubbles will build up and be released as larger bubbles. If you run your diffuser at a high flow, your substrate will end up being blown off it and around your tank. This is bad for both your filter and your fish. For the same reason, you should avoid setting your diffuser anywhere it can end up blocked. For instance, putting it underneath decorative items where the flow of carbon dioxide will be interrupted. Another place you shouldn’t put your diffuser? Right in the middle of your plants. This may sound counter-intuitive, but just think about it. Your plants can also be obstacles that get in the way of your diffuser doing its job. This is more likely if you have thick underwater vegetation. Carbon dioxide bubbles will collect rather than disperse, just as with your substrate. Refrain from mounting your diffuser too high up on your tank. 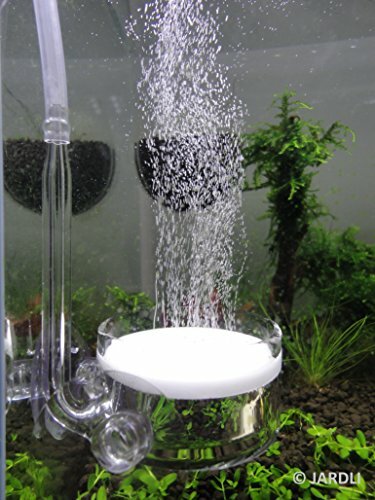 The carbon dioxide bubbles will disappear from the surface rather than circulate in your aquarium. The best place to set your CO2 diffuser is anywhere with water motion. After all, the point is to diffuse carbon dioxide throughout your tank. If you have a wave maker or a power head, place your diffuser beside it. If not, you can place it next to your filter return. A CO2 diffuser is a key part of any safe, established, carbon dioxide setup in an aquarium, and now you know how to pick a quality diffuser that’s just right for your individual tank. If you have any unanswered questions about CO2 diffusers, drop us a comment and we’ll get back to you. We’d love to hear from you – please share your feedback, tips, or stories in the comments below.